I always like to pause and savour the moment, or reflect, on anniversaries -including those from other Faiths and significant past events – when I am aware of them. I find it particularly potent to do so when these events have a time associated with them. Interestingly, while with most events in the world we take the anniversary as being the time that corresponds to when it happened in the place that it happened, Bahá’í anniversaries tend to be remembered at the local time that matches what the local time was in the place it happened. The result of this is that, rather than everyone in the world marking the moment at the same time, there is a 24 hour wave of events and individual remembrance that circles the planet with the sun (or with the time zones). 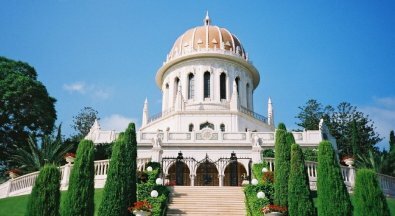 While it may have been about 2 hours and 11 minutes after sunset that The Báb declared Himself to be a Prophet, the whole day is considered to be the anniversary (the Bahá’í day being from sunrise to sunset) and so many Bahá’í communities hold their celebration at a time that isn’t so late at night. As Newcastle community has a Bahá’í Centre adjoined to a residential property we have to hold our event early the following evening (so ours is at 6:30 tonight). Gregorian Dates of special Bahá’í days in coming years. Click to enlarge. On July 9th each year, we remember the day when the Báb (whose name means “The Gate”) was martyred. A century later Shoghi Effendi called it “the most dramatic, the most tragic event” in the whole of Bahá’í history – an honour that presumably stands today, just over 150 years after the event. The Báb’s life foreshadowed Bahá’u’lláh’s. In 19th century Persia He announced that He was a religious teacher prophesied in religious scripture, and that another even greater Prophet was to come soon after. His teachings very quickly attracted great interest and within a few years he had up to a million followers from all walks of life. Persia’s priests as well as its government saw Him as a massive threat to their power, and the crackdown on the young Faith was not long coming. The Báb was imprisoned in a remote corner of northwest Persia, while Bábis were caught up in armed struggles all around the country and many died appalling deaths. But the ministers and priests began to think the only way to destroy the movement was to destroy its Leader, and they set on having Him killed. They ordered the Báb to be transferred from the bleak fortress in Chihriq, where He was being held prisoner, to the army barracks in nearby Tabriz. Early in the morning on July 8th 1850, the Báb and his companions were led through the streets of Tabriz in chains. A crowd massed round them on the way to the barracks, hurling insults, throwing stones at their faces. Not far from the courtyard, a Bábi called Mirza Muhammad-‘Ali burst through the crowd and begged the Báb to let him be martyred with Him. The Báb said, “Arise, and rest assured that you will be with Me. Tomorrow you shall witness what God has decreed.” Two other friends of the youth also forced their way through the crowd and pledged their loyalty, and they were all imprisoned in the same cell. That night, the Báb appealed to His friends: “Tomorrow will be the day of My martyrdom. Would that one of you might now arise and, with his own hands, end My life. I prefer to be slain by the hand of a friend rather than by that of the enemy.” The very thought brought tears to His disciples’ eyes. But Muhammad-‘Ali jumped up, offering to do anything the Báb desired. The others protested in shock, but the Báb announced that as the young man was truly devoted, tomorrow he would be martyred with the Bab just as he wished. The next morning, just before He was taken to receive His death warrant from the ruling priests, the Báb gave final instructions to His secretary and close companion, Siyyid Husayn. But before He had finished, the prison officer entered and shouted at Siyyid Husayn for holding up the proceedings. The Báb replied, “Not until I have said to him all those things that I wish to say can any earthly power silence Me. Though all the world be armed against Me, yet shall it be powerless to deter Me from fulfilling, to the last word, My intention.” The prison officer separated the two nonetheless. The task of execution was given to a colonel called Sám Khan and his regiment. Sám Khan was a Christian from Armenia and he did not share the Persian government’s hostility for the Báb. The fame and reverence of the Báb led him to fear he might be killing a holy man, and he was reluctant to carry through the execution. But the Báb told him he had nothing to fear, reportedly saying, “Follow your instructions, and if your intention be sincere, the Almighty is surely able to relieve you of your perplexity.” Sám Khan went ahead as planned. At noon on July 9th 1850, The Báb and his friend were hung by their arms from ropes attached to the wall of the barracks, in front of a firing squad of 750 guns, split into three groups. Atop the roofs of the barracks buildings and nearby houses a crowd of around 10,000 people gathered to watch the extraordinary figure being executed. Each of the three groups of 250 guns fired in turn. The smoke was so dense that only after the air had cleared did the spectators see there was no sign of the Báb – He had apparently disappeared. His friend, meanwhile, was standing alone and unhurt with his ropes cut. The crowd went into uproar. The military officers frantically searched for the Báb, and found Him finishing His conversation with Siyyid Husayn in the same nearby room where He had been interrupted before. As soon as the prison guard entered, the Báb told him, “I have finished My conversation with Siyyid Husayn. Now you may proceed to fulfil your intention.” The guard was so dumbfounded that he walked out and immediately resigned his job, while Sám Khan ordered his men to leave the barracks and refused to have any further part in the affair. But the colonel of the bodyguard volunteered his own regiment as a replacement. The Báb and His companion were again suspended from the barrack wall and 750 guns fired on them. This time though, bullets riddled the two bodies until they were apparently a single mass of flesh and bone. The Báb’s last words were these: “Had you believed in Me, O wayward generation, every one of you would have followed the example of this youth, who stood in rank above most of you, and willingly would have sacrificed himself in My path. The day will come when you will have recognised Me; that day I shall have ceased to be with you.” The moment the shots were fired, a violent gale rose over the city and a dust whirlwind darkened the sky from noon until night. s of an abandoned temple; concealed within various Bahá’ís’ houses – a secret from even the Bahá’í community – until at last they were laid to a proper rest in Haifa in 1909, by a tearful ‘Abdu’l-Bahá. ‘Abdu’l-Bahá pictured a string of terraced gardens leading up the mountain to a shrine for the Báb and beyond to the mountaintop. Just under 50 years ago, Shoghi Effendi finished building the golden-domed shrine that now houses the Báb’s remains, and in May this year after ten years of work, the terraced gardens were finished. The Dawn Breakers: Nabil’s Narrative of the Early Days of the Bahá’í Revelation, chapter 23. There are some amazing stories in the history of the Bahá’í Faith. The events surrounding the Declaration of the Báb after sunset on the evening of 22nd May 1844 supply us with a few of those stories, I’ll try to give a glimpse of them here but see the links at the end to get the full stories. The Báb is the forerunner of Bahá’u’lláh, he is regarded by Bahá’ís as a “Manifestation of God” (a Prophet or Messenger) in His own right and those who followed Him were called Bábís. The Bábs main mission was to foretel the coming of Bahá’u’lláh, the title “Báb” means “Gate”. In the late 18th and early 19th centuries lived a man called Shaykh Ahmad who had a very deep understanding of the Quran (the Holy Book of Islam). Shaykh Ahmad became certain that The Promised One (“The Qá’im”) whose coming was foretold in the Quran was close at hand and in his later days he even believed that The Promised One was alive on Earth. Shaykh Ahmad travelled through the Persian Gulf teaching people about the Quran and The Promised One. He gained a reputation for being able to answer questions about the Quran that nobody else could, but his views on the Promised One meant that he had his opponents as well as a large band of followers. In 1819 Shaykh Ahmad suffered the loss of his son, whose name was Ali, he comforted his mourning disciples with these words: “Grieve not, O my friends, for I have offered up my son, my own Ali, as a sacrifice for the Ali whose advent we all await. To this end have I reared and prepared him.” In that same year The Báb was born in the city of Shiraz, his name was Ali-Muhammad. His parents were both descendants of the Prophet Muhammad. Among the dedicated followers of Shaykh Ahmad was a man called Siyyid Kazim, Siyyid Kazim was also recognised for his intellectual powers and spiritual insight. At the age of 22 he set out to meet Shaykh Ahmad and followed him for the rest of his life. Before Shaykh Ahmad died in 1826 he asked Siyyid Kazim to continue his work in preparing hearts for the coming of the Promised One. Siyyid Kazim actually met Ali-Muhammad, The Báb. A follower of Siyyid Kazim called Shaykh Hasan-i-Zunuzi had started entertaining doubts about the teachings of Siyyid Kazim and was going through a period of praying a lot about this matter when one morning he was awoken at dawn by one of Siyyid Kazim’s intimate attendants who, in great excitement, asked Shaykh Hasan-i-Zunuzi to follow him to the house of Siyyid Kazim. When they arrived at Siyyid Kazim’s house they found him fully dressed and ready to go somewhere. “A highly esteemed and distinguished Person has arrived.” he said, “I feel it incumbent upon us both to visit Him.” The following are the words of Shaykh Hasan-i-Zunuzi: “We soon reached a house, at the door of which stood a Youth, as if expectant to receive us. He wore a green turban, and His countenance revealed an expression of humility and kindliness which I can never describe. He quietly approached us, extended His arms towards Siyyid Kazim, and lovingly embraced him. His affability and loving-kindness singularly contrasted with the sense of profound reverence that characterised the attitude of Siyyid Kazim towards him.” They were invited upstairs and spent a fair while there but the only words spoken in that meeting were a short verse of the Quran which the Youth quoted as he handed Siyyid Kazim a drink. Three days after his return to Karbila, Siyyid Kazim died. He had already told his students that the Promised One was alive among them and that they should search for him. On the evening of 22nd May 1844 one of these students, Mulla Husayn, who had been travelling with his brother and a nephew, arrived at the gate of the city of Shiraz. “The Youth who met me outside the gate of Shiráz overwhelmed me with expressions of affection and loving-kindness. He extended to me a warm invitation to visit His home, and there refresh myself after the fatigues of my journey. I prayed to be excused, pleading that my two companions had already arranged for my stay in that city, and were now awaiting my return. “Commit them to the care of God,” was His reply; “He will surely protect and watch over them.” Having spoken these words, He bade me follow Him. I was profoundly impressed by the gentle yet compelling manner in which that strange Youth spoke to me. “As I followed Him, His gait, the charm of His voice, the dignity of His bearing, served to enhance my first impressions of this unexpected meeting. We soon found ourselves standing at the gate of a house of modest appearance. He knocked at the door, which was soon opened by an Ethiopian servant. “Enter therein in peace, secure,” were His words as He crossed the threshold and motioned me to follow Him. His invitation, uttered with power and majesty, penetrated my soul. I thought it a good augury to be addressed in such words, standing as I did on the threshold of the first house I was entering in Shiráz, a city the very atmosphere of which had produced already an indescribable impression upon me. Might not my visit to this house, I thought to myself, enable me to draw nearer to the Object of my quest? Might it not hasten the termination of a period of intense longing, of strenuous search, of increasing anxiety, which such a quest involves? As I entered the house and followed my Host to His chamber, a feeling of unutterable joy invaded my being. Immediately we were seated, He ordered a ewer of water to be brought, and bade me wash away from my hands and feet the stains of travel. I pleaded permission to retire from His presence and perform my ablutions in an adjoining room. He refused to grant my request, and proceeded to pour the water over my hands. He then gave me to drink of a refreshing beverage, after which He asked for the samovar and Himself prepared the tea which He offered me. “That night, that memorable night, was the eve preceding the fifth day of Jamadiyu’l-Avval, in the year 1260 A.H.
“At the third hour after sunset, my Host ordered the dinner to be served. That same Ethiopian servant appeared again and spread before us the choicest food. That holy repast refreshed alike my body and soul. In the presence of my Host, at that hour, I felt as though I were feeding upon the fruits of Paradise. I could not but marvel at the manners and the devoted attentions of that Ethiopian servant whose very life seemed to have been transformed by the regenerating influence of his Master. I then, for the first time, recognised the significance of this well-known traditional utterance ascribed to Muhammad: “I have prepared for the godly and righteous among My servants what eye hath seen not, ear heard not, nor human heart conceived.” Had my youthful Host no other claim to greatness, this were sufficient—that He received me with that quality of hospitality and loving-kindness which I was convinced no other human being could possibly reveal. “He then addressed me in these words: “O thou who art the first to believe in Me! Verily I say, I am the Báb, the Gate of God, and thou art the Bábu’l-Báb, the gate of that Gate. Eighteen souls must, in the beginning, spontaneously and of their own accord, accept Me and recognise the truth of My Revelation. Unwarned and uninvited, each of these must seek independently to find Me. And when their number is complete, one of them must needs be chosen to accompany Me on My pilgrimage to Mecca and Medina. There I shall deliver the Message of God to the Sharif of Mecca. I then shall return to Kufih, where again, in the Masjid of that holy city, I shall manifest His Cause. It is incumbent upon you not to divulge, either to your companions or to any other soul, that which you have seen and heard. Be engaged in the Masjid-i-Ilkhani in prayer and in teaching. I, too, will there join you in congregational prayer. Beware lest your attitude towards Me betray the secret of your faith. You should continue in this occupation and maintain this attitude until our departure for Hijaz. Ere we depart, we shall appoint unto each of the eighteen souls his special mission, and shall send them forth to accomplish their task. We shall instruct them to teach the Word of God and to quicken the souls of men.” Having spoken these words to me, He dismissed me from His presence. Accompanying me to the door of the house, He committed me to the care of God. The Baha’i day starts at sunset and so we celebrate the Declaration of The Bab on 23rd May each year, or often 2 hours and 11 minutes after sunset on the 22nd. To read more about this story, or the stories of the other followers who were among the first to discover and recognise the Báb for themselves, the best thing is to read The Dawn Breakers, available online here. If you prefer to listen to the stories, you can download the children’s version read by William Sears from this page.